In many ways the 1980s were the Jan Brady of decades – it was an era that sought to escape the shadow of its older sibling while never quite managing to do so. That first wave of Gen Xers navigated a barren musical landscape of corporate rock and synth-heavy pop, ogled MTV and “Miami Vice,” and watched in mock-horror as the Rock ‘n’ Wrestling Connection was born. That’s not to say all was awful about the decade. The Bangles, who percolated up from L.A.’s Paisley Underground scene into the mainstream in 1986 on the strength of the retro-pop of the Prince-penned “Manic Monday,” were one joy. 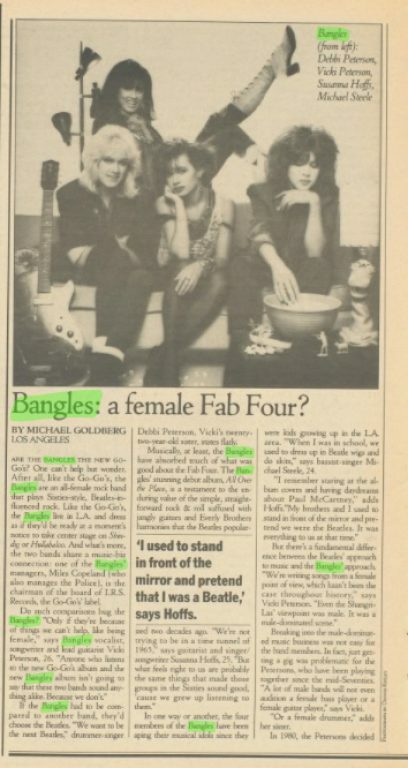 I first learned of them a few years before, in March 1983, due to the headline “Are the Bangles the New Go-Go’s?” that topped a Rolling Stone “Random Notes” piece about their first EP. The following month a Kurt Loder-penned review of the EP said they were “probably fated to be perceived as “the new Go-Go’s” before suggesting that, aside from gender, they shared little of the same musical DNA with their erstwhile rivals. The Go-Go’s were akin to pre-Beatles girl groups, he said, while the Bangles were more Mersey Beat and Hollies. The review intrigued me enough to want to buy the EP, but finding the vinyl for such a small release in the pre-Internet age was near impossible, at least here in the suburbs. “I used to stand in front of the mirror and pretend that I was a Beatle,” says Hoffs. So All Over the Place, the album they were promoting, was actually the first time I heard them – well, not quite. Before I bought it, I caught the videos for “Going Down to Liverpool” and “Hero Takes a Fall” (yes, I was one who ogled MTV in its early years). They’re what sealed the deal. Twenty-eight years later and I’m still a fan, and for the same reasons I was then: the music. It’s poppy, playful and sweet, but never sickly sweet, sometimes serious and always filled with melodies that can’t be beat. 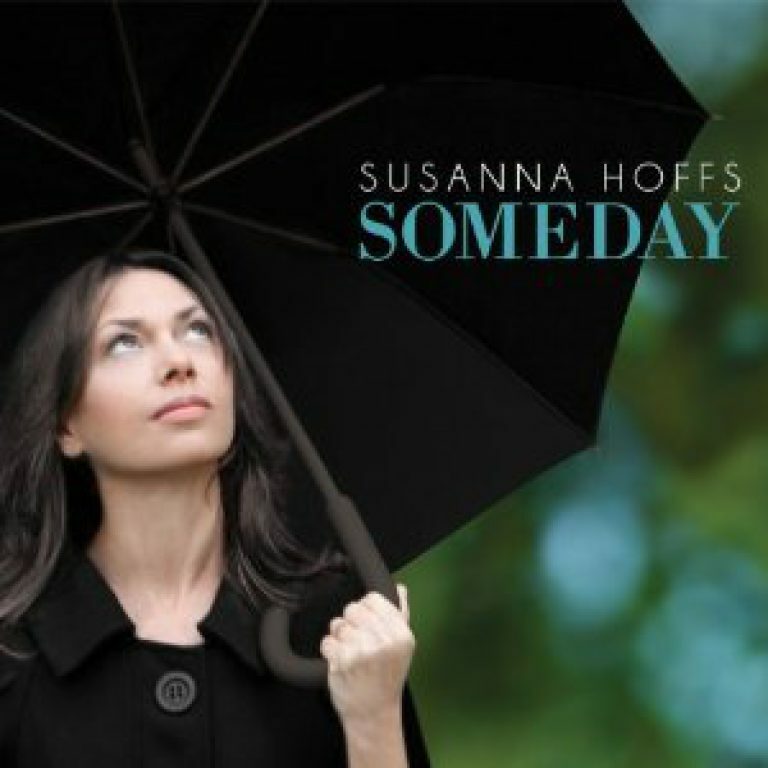 Which leads to the point of this post: the new Susanna Hoffs album, Someday, and her recent free EP, Some Summer Days. The album is a sublime delight, awash in such halcyon influences as the Beatles, Beach Boys, Burt Bacharach and Dusty Springfield while retaining an original, fresh feel. “Picture Me,” for instance, could well be a lost treasure from Dusty in Memphis. It features a delectable melody that’s accented by the judicious use of horns, which are akin to whipped cream on top of an already delicious Frappuccino. (As the link shows, even stripped to the bare essentials the song is utterly charming.) “Picture me like a melody,” she sings near the end in a tender, girlish voice and, if you close your eyes, you’ll do just that. I could rave in similar fashion about the rest of the songs – and I suppose, in a sense, I just did. Another of my favorites, “One Day,” opens with a declaration driven in equal parts chutzpa and insecurity: “One day I’m going to make everybody love me.” The Bacharach-esque melody is pushed forth by a whirlwind of woodwinds and strings that slowly seep into the mix –one can easily imagine Dionne Warwick fronting the song in the mid-‘60s, especially when the backing vocals come in toward the end. It’s an absolutely wondrous, magical moment. “This is the Place,” too, is a track out of time – it would’ve been at home on the Under the Covers, Vol. 1 collection of ‘60s classics that Hoffs and Matthew Sweet released a few years back. The EP, which was recorded in a day, features acoustic takes on three of theSomeday songs (“Raining,” “One Day” and “Always Enough”) and tosses in two equally cool non-album tunes (which, sad to say, aren’t on YouTube). For the price, it definitely can’t be beat. To say that Someday is the best work Susanna Hoffs has done doesn’t cheapen or denigrate any of her past efforts, whether with the Bangles, Matthew Sweet or on her own – and while I’m tempted to write just that, the truth is it’s far too soon to make such a sweeping pronouncement. So I’ll say this instead: it’s the best album I’ve heard all year. And I’ve heard a lot.